"Radiant Orchid blooms with confidence and magical warmth that intrigues the eye and sparks the imagination. It is an expressive, creative and embracing purple—one that draws you in with its beguiling charm. A captivating harmony of fuchsia, purple and pink undertones, Radiant Orchid emanates great joy, love and health." If you don't work in a design-related industry, you might wonder what the heck the "color of the year" is exactly. "For more than a decade, Pantone’s Color of the Year has influenced product development and purchasing decisions in multiple industries, including fashion, home and industrial design, as well as product packaging and graphic design." So next year, as you are strolling through the mall and see lots of this color everywhere, think back to this blog post and say, "Ahh, I get it!" The photo on the right is an example of a bridesmaid's dress from Dessy in Radiant Orchid. Will you incorporate this color into your wedding? Share your ideas in the comments section! I had the most delightful package arrive this week - our friends at Plum Pretty Sugar sent a sample of their beautiful new robes! They have all sorts of gorgeous options that would be great gifts for your bridesmaids. Most popular are the knee-length kimono style robes, and there are lots of great prints to chose from. But don't stop there! They also have tank/lounge pant/robe sets, cover ups, and all sorts of other loveliness in their shop. Stop by their Flickr page for a glimpse at real live brides and bridesmaids showing off their Plum Pretty Sugar attire. Do You Need A Professional Makeup Artist? Being on time. Think back to your senior prom, when you did your own hair and makeup. Did things go exactly as planned? Usually not. Less stress. Why not sit in a chair for an hour and relax while someone makes you more beautiful? Much better than standing in the hotel room's bathroom. Play up your best features and hide any flaws. Just because your photographer can photoshop that zit, he or she doesn't want to have to do that in 1,000 photos. A professional makeup artist can hide any little imperfections without making them more obvious. Long-lasting coverage. You'll be sweating, dancing, kissing, and eating during your wedding day. And from the time your makeup is done in the morning to the time you leave your reception, that can be a 10-hour day. Proper intensity for photographs. We've all seen those photos of brides whose face looks three shades lighter than the rest of their body, or they look like they aren't wearing makeup at all. Just like models have more dramatic makeup, you'll need to step it up a bit for your wedding day too. A professional makeup artist knows how to achieve this while still making you look like "you." The most important step in hiring a makeup artist is scheduling a trial run. You'll want to be sure you're happy with the results, but long before the wedding day. In fact, having your makeup done the same day as your engagement photos kills two birds with one stone! Then, if you aren't happy with the look, you have time to make adjustments rather than having a melt-down on your wedding day. It happens. We all gain a few pounds here and there. And if you channel surf at any point during the day, you'll see a least a dozen infomercials for losing the weight. An exercise program, a dietary supplement, a food plan. So what should you do if you want to shed those unwanted pounds before your wedding? Don't do anything drastic. If you don't eat for three days before your wedding, no one will want to be around your cranky self. Including your husband. Do more activity to burn calories. When you are planning your wedding, you tend to get wrapped up in the details and spend hours sitting in front of the TV watching reality shows or flipping through bridal magazines. Get up, take a walk with your fiance, or watch Bridezillas on the treadmill at the gym. Don't forget about weight training. It's easy to think cardio is the only way to lose weight. But if you are dieting, you risk losing muscle along with fat unless you do resistance training to keep up the muscle. Try to eat every three to four hours. Plan out your meals the night before, and pack your lunch and snacks to take with you to the office. Drink plenty of water. Which is a good rule of thumb in general, but it can keep your metabolism running strong too. Most importantly, think about making some lifestyle changes permanently, not just before the wedding. Get into the habit of working out with your fiance, learn to cook healthy meals together, or find an activity you can both enjoy. 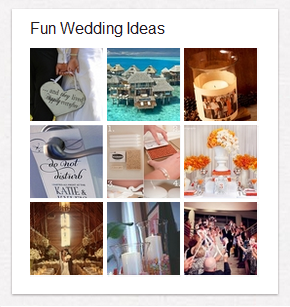 The internet is full of wedding ideas - it can be overwhelming! How do you keep track of everything you like - endless bookmarks, stacks of printed pages, a super-long string of emails between you and your Maid of Honor? Enter: Pinterest. Pinterest is an online pinboard that lets you organize and share things you find on the web. You can create multiple boards - one for dresses, one for hairstyles, one for flowers, the list goes on and on - so that everything stays neatly organized. And even better, you can share your boards with anyone, and they can comment on your pins. What a great way to collaborate! Just remember, anyone can see your board - so if you want to keep your wedding details a secret, you might want to look at other options. Right now, Pinterest is by invitation only - but if you need an invite, feel free to leave a comment below and I'll send you one. I recently attended an event in Orlando for wedding professionals featuring none other than Randy Fenoli, star of Say Yes To The Dress and Fashion Director at Kleinfeld Bridal. At the end of his presentation, Randy opened the floor to questions. I asked, "What is the one thing you wish every bride would do before their first dress appointment?" After the shouts of "wear underwear!" from every seamstress and bridal shop owner in the audience, Randy answered the question quite simply: bring in pictures! He suggests pulling a few pictures (don't get carried away) from magazines of dresses that you like. He said he can tell a lot from a picture - and it's not always about the actual dress. It might be the fabric, it might be the look on her face. So don't be afraid to bring in some ideas when you make your first appointment to try on gowns. Randy has a new book coming out in November, which you can pre-order on Amazon.com. It will have tons of his tips - and will feature only photos of real brides in real dresses in every shape and size. We can't wait to read it, Randy, and thanks for helping make every bride beautiful! So your wedding 'do is all picked out and ready to go. Now what? Whether it's an extravagant feathery flower or a delicate headband, these hot wedding hair accessories will be sure to liven up your style. 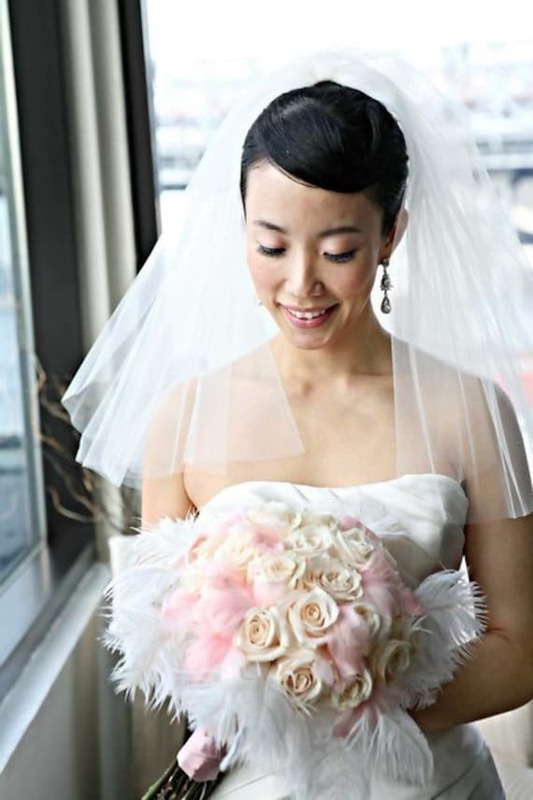 Depending on the hairstyle, this feather flower idea is perfect to stick right into the knot of this up-do. A more simple accessory would be this crystal hair tie. It really holds these curls into place and is just the right size to not draw too much attention away from this exquisite hairstyle. Windy days are the worst. Especially when it comes to your hair on your special day. In this case, an elastic headband is a great choice to keep your hair tamed, while also looking 100 percent gorgeous. 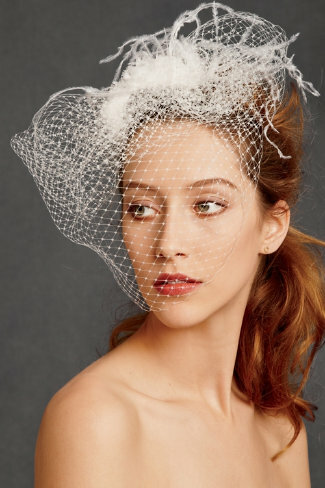 Also known as a birdgecage veil, the blusher veil is very short and has only one layer of material. It falls just below the chin and complements any style of dress. This type of veil is considered more formal then the blusher and is made from two layers of material. The first layer covers the face during the ceremony and the second layer extends to the floor. This type of veil works best with wedding dresses that have a longer train and are more formal. This type of veil is made with either one or two layers of material. The length of the veil extends to the bride’s fingertips and looks great with formal, floor length gowns. The flyaway veil is less formal and is made from several layers of material. This veil is worn short and falls just below the bride’s shoulder blades. It can be worn with less formal dresses that are short or ones with no train. 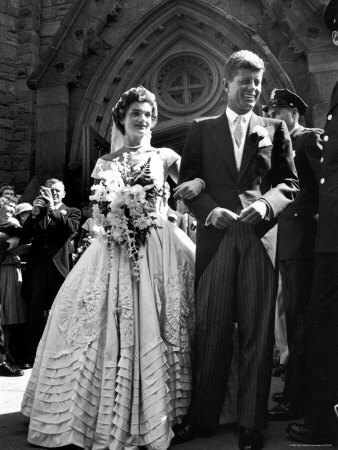 Jackie Kennedy’s 1953 wedding to the future president John F. Kennedy where the bride wore a gown created by designer Ann Lowe of New York City. This famous dress is now housed in the Kennedy Library of Boston. Grace Kelly’s 1956 wedding to Prince Rainier of Monaco where she wore a Helen Rose gown that featured 100 yards of silk net, 25 yards of silk taffeta, and century old lace. Priscilla’s 1967 Vegas wedding to Elvis Presley where she wore a beaded white gown designed by the bride herself. 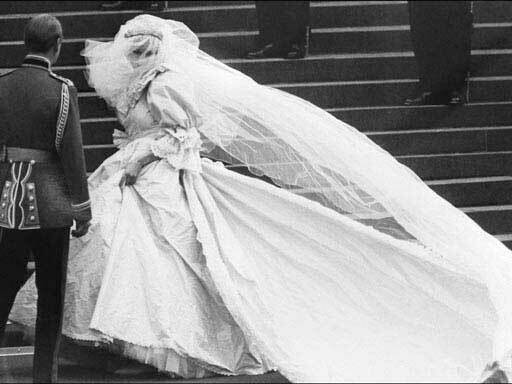 Lady Diana Spencer’s 1981 wedding to Prince Charles wearing a gown made by David and Elizabeth Emanuel. The dress was made of 6 different fabrics and had a 25 foot train. Carolyn Bessette’s 1996 wedding to John Kennedy Jr she wore a silk crepe Narcisco Rodriguez gown valued at $40,000. Start early. Don't wait until 2 weeks before the wedding to try to lose 20 pounds. Set realistic goals. If you are a size 20, chances are you won't be a size 2 in 6 months. Consider meeting with a nutritionist and personal trainer. These experts can help you determine proper diet and exercise routines based on your height, weight and body type. Use the buddy system. Find a friend (or all of your bridesmaids, perhaps?) to share your workout routine and diet plan with. Or, look for a bridal boot camp to work out with other brides to be! Reward yourself. Sticking to your weight loss plan is great, but having fun is important too! Treat yourself to ice cream on date night, or skip the gym and go for a long walk with your fiance on the beach. Buy a dress that is way too small. Even if you are dedicated to losing weight, things happen. It's always easier to take a dress in than to let one out! Try a new diet every week. Talk to a professional when you get started, and stick to a steady plan. Not eat. Fasting makes you more irritable, tired, and less able to deal with stress. Eat too little. Just like fasting, cutting your calorie count too much can be dangerous. A bride in England even died of heart failure from eating a measly 530 calories for 11 weeks. It's just not worth it! Focus on the wedding day. Make lifestyle changes so that you will be healthier all around! Married couples tend to gain weight at a faster rate than their single peers. If you are anything like me, you are a sucker for makeup. I can barely walk by a Sephora without asking about their sales or specials. Unfortunately, make up has never been one of the cheapest purchases- until now! I am pleased to introduce you to ELF, also known as Eyes Lips Face. Their website, www.eyeslipsface.com, offers everything (and I do mean everything!) in the book. From brushes to balms to bronzers, you can find it here! And the best part? You can find just about any item for one dollar! They do have certain products that cost a little bit more, but for the most part, I can get everything I need for my face for under ten dollars. Talk about excitement! Skeptical of the value of the actual product? I was, too, but after testing out some of the goods, I was pleasantly surprised. Don't get me wrong, nothing can beat my favorite makeup brands, but ELF was just as good (if not better) than any drugstore brand I've ever used. BONUS! If you google 'ELF Coupons,' you can find tons of discount codes that you can use when you checkout, making your inexpensive purchase even more so! Next time you get the urge to go on a makeup shopping spree, keep ELF in mind! What have you got to lose... besides a few George Washingtons?